Mimi was born on a hot July morning in the borough of Manhattan, and raised in the suburbs of New York City, on the edge of the old Baldwin Farm. She grew up loving cats, My Little Pony, The Smurfs, Judy Bloom, Nancy Drew, and running around in the woods with her brother. She loves the smell of fresh cut grass, and warm cat fur. She is a synesthete: she sees numbers, particularly decades, in colors. She became a vegetarian at the age of 13, and has always been a self-identified queer feminist anti-racist and animal-rights activist. Her earliest musical influences include The Beatles, Dolly Parton, David Frost & Billy Taylor: Merry Christmas, Aretha Franklin, Ella Fitzgerald, The Mamas and Papas, and The Big Chill Soundtrack. Mimi attended The Masters School in Dobbs Ferry, NY, and Princeton University. After graduating, she moved to Manhattan to sing and act. 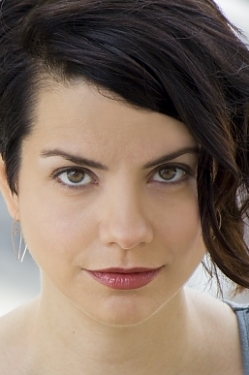 She has appeared off-Broadway (The Donkey Show) on film and television (Law & Order: SVU, As The World Turns), in commercials, and has fronted two NY-based rock bands, Audio Fiction and The Reformationists. Mimi performed all over North America in the Broadway National Tour of RENT, appearing as Maureen, Mimi and various ensemble members. In 2006, she was diagnosed with breast cancer. While resuming her performing career the following year, she completed the professional program at NYU's CAP21 Musical Theater Conservatory, and began studying intensively with teachers Jen Waldman, Sheri Sanders, Matt Farnsworth, Karen Dryer (Liz Caplan Studios), and Andrew Byrne. She continues to audition for union acting work, especially in TV shows that film in NY. An avid yoga practitioner, in 2011 Mimi obtained her Vinyasa Yoga teaching certification from Frog Lotus Yoga International, and an additional certification at OM Yoga in teaching yoga to women who have/had cancer. She teaches group classes through Yoga 4 Cancer and is also available for private sessions. Mimi lives in Manhattan, drinks lots of green smoothies, and hangs out with her two orange cats. Please follow her on twitter: @mimiferraro.